Two decades after leaving Iraq as a refugee, orthopedic surgeon Deiary Kader now returns regularly, leading volunteer medical missions to help the people of his native region. He also fosters medical advances around the world through his work as Editor-in-Chief of the open-access Journal of Orthopaedics and Trauma from Ashdin Publishing. This is his story of opening doors to better health for the most needy, through surgery performed in war zones under truly demanding conditions. Deiary Kader, a young doctor from Kurdistan, once fled Iraq as a refugee. Seventeen years later, he returned for the first time to his native land, now a professor, surgeon and Editor-in-Chief of the open-access Journal of Orthopaedics and Trauma. After years of war, the country was devastated, with dire humanitarian and medical needs. Prof. Kader’s goal was to identify patients who required the assistance of an orthopedic surgeon. Over the past two decades, many medical workers have left Iraq, for security reasons. The surgeons who remain are trained in trauma surgery, but not the important elective procedures that can vastly improve one’s health, ability to work and general quality of life. Experience, expertise and supplies for this type of surgery are all lacking. "I didn’t expect to find it so backward and so hard for people there," Kader recalls about his first trip back to the region, five years ago. Before returning to Kurdistan, he already knew he would find a standard of care inferior to what is offered in England. 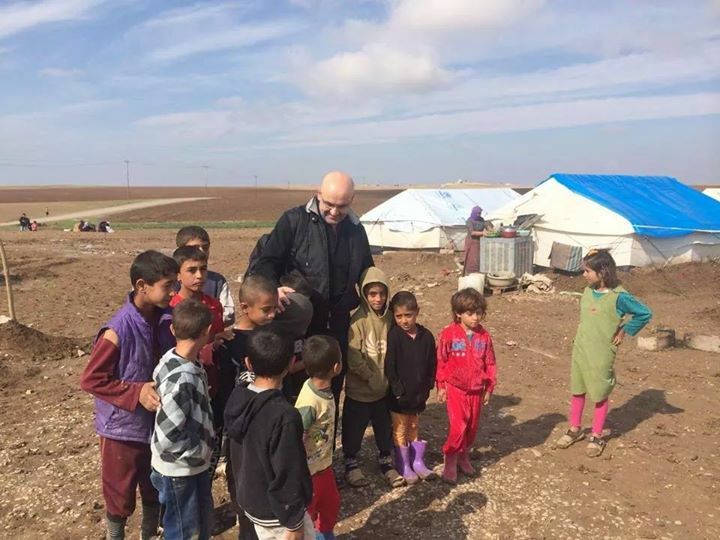 Even so, in the community around his birthplace, the city of Erbil, about an hour’s drive from Mosul, he was surprised by the severity of disabling health conditions he found there. These were problems that could easily have been prevented in more developed countries: knee and ligament injuries that were not properly treated, fractures, long-term arthritis necessitating joint replacements. The experience would lead Prof. Kader to return, with a growing number of volunteers, to perform much-needed operations like these. Giving hope to those who were left with so little, their work is genuinely changing people’s lives—not the least of which their own. "The Best Demonstration of Teamwork"
During the two weeks they take away from family and jobs back home to carry out these medical missions to Iraq, Kader and his small team of volunteers not only perform 45 to 50 operations themselves, but train local medical and support staff. They help improve hospital protocols, introducing, for instance, the practice of tracking patients’ post-operative pain. In 2012, Kader brought an expert colleague with him to instruct 50 medical workers on the use of ultrasound machines to scan babies’ hips. Congenital hip dislocation is a common and debilitating problem in Kurdistan, simply because no protocol has been in place to screen newborns. "This is something you can treat easily at four or five weeks of age," Kader explains, "not at five years, though." In other words, an ounce of prevention is worth a pound of cure, and the specialist’s instruction was a "massive contribution," he says. Kader has seen firsthand the troubles that arise when training and information are lacking, something that contributed to his taking on the role of Editor-in-Chief of the open-access Journal of Orthopaedics and Trauma from Ashdin Publishing. He believes open access is "an excellent idea, because it reaches out to more people. It’s not exclusive." With the journal and his volunteer missions, he helps knowledge flow into less privileged regions of the world, but the learning is not all one-sided. The rewards are equally clear for the surgeon and the volunteer medical staff who travel with him to Kurdistan twice a year. "You’re up at 6AM every day, working 12-hour days, but everyone works together to get the mission accomplished. It’s extremely positive and satisfying." Kader says. For the surgeons, nurses and physiotherapists making up the full-service team, the experience is just about as life-altering as the operations they perform. Certain team members had never even held a passport before. Their first trip abroad took them well outside their comfort zone, into a pretty grueling situation. But, in the end, "the majority of the team cry when they leave," Kader reveals, so strong is the bond they form with Kurdistan and its people. The trips are even rewarding in terms of surgical skills gained; it’s one big learning experience when conditions force you to improvise. "When we started, we were using a DIY-type drill on patients. And what do you do when the drill breaks in the middle of surgery…? There are these panicky situations that you’re forced to deal with." Working through these challenges increases team members’ confidence, as well as their respect for resources. "Back in the UK, I learned to become less wasteful than others," Kader feels. Where others might use multiple surgical tools—differently shaped instruments for different purposes—he has learned to need only one. "My hands are used to that. You adapt and improvise." In the UK, one might open three or four packets of disposable items, in case the surgeon needs them. In Kurdistan, you don’t open anything unless you need it. There is knowledge to be gained from the Iraqi health system, too, Kader notes. One example has allowed him to shorten hospital stays for some of his UK patients. For certain operations, he would have kept someone in the hospital for four days, but in Kurdistan they were going home in half that time. This was by necessity, of course, but Prof. Kader felt empowered by what he had seen in Iraq to get his patients home faster. The surgeon sees no end in sight for his missions to help the poorest people of this region. For one thing, there is an "endless amount of work. There are 76 patients waiting for operations in one hospital alone." More and more volunteers want to join him, as well. At the moment, they don’t have the funds to organize more than one or two trips per year, with all the necessary—and expensive—medical supplies. Fortunately, the orthopedic industry has been extremely supportive by donating supplies. Hospitals have also given them anything that can be spared and products approaching their expiration date. Kader now also works with larger organizations, such as the International Committee of the Red Cross, which helps Syrian refugees in Lebanon. All of these experiences have taught him one more thing: "I have realized there is a lot of goodwill in people that has not been tapped or explored. People are very giving. That’s something that, unfortunately, is not acknowledged." When asked what he would like the world to know about his missions, Kader doesn’t appeal for more support. Rather, he wants people to know this is not just about his native land. While the world is full of bad news, his humanitarian work lets him cross paths with good people from around the world and take part in all the positive news they create.